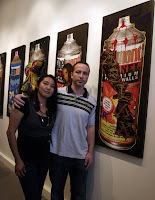 Crewest Gallery News: BELMONT TUNNNEL OPENING NIGHT! 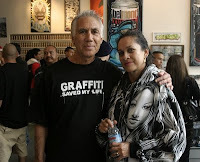 We had a great turnout, hundreds showed up to peep the exhibition included fans, artists, collectors, and a few celebs. Here is a synopsis of that night through the lens of our good friend and dope LA photographer Eriberto Oriol. Outside the line was long..
MORE ARTWORK AND PARTY PHOTOS HERE!